There are countless types of parking decks out there. Take a moment to think about yours. Is it subject to high traffic on a regular basis? If so, then it’s time to start thinking about concrete protection. The fact is that many parking decks are exposed to chemical and environmental impacts you may not have previously aware of. Why do these impacts warrant your attention? The biggest thing is they can shorten your deck’s service life. That means more money out your company’s pocket in the long run. 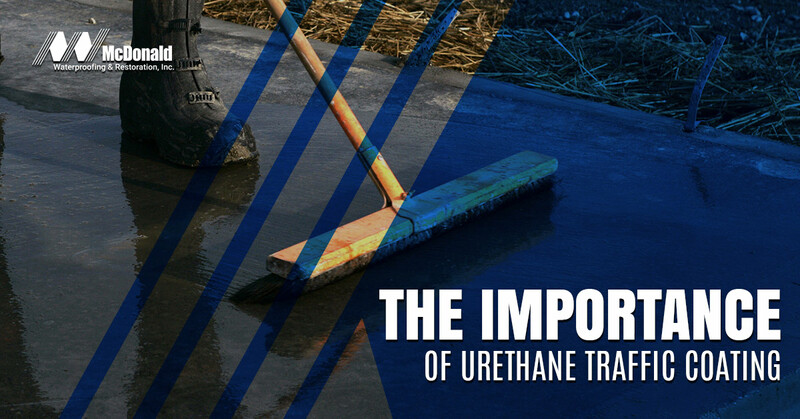 Keep reading as we dive further into the importance of urethane traffic coating. Here at McDonald Waterproofing & Restoration, our concrete protection involves urethane and silicone caulking and epoxy, urethane and methacrylate coatings. The protection systems we use essentially add a coat of armor to your concrete surfaces. Once we apply the coating, the surface regains durability so it can withstand even the most significant amount of traffic. Here’s the thing: constant stressors eventually cause cracks to appear in your deck’s surface. Down the road, those cracks could damage the integrity of the concrete. How exactly? Let’s start with the reality that moisture gets trapped in the cracks. As the moisture expands, further cracking results in a domino effect. This leads to a cycle of continuous damage. Whether you need concrete protection, concrete crack repair, concrete replacement, concrete strengthening, concrete waterproofing, or extensive concrete restoration, the team at McDonald is here to help. For nearly two decades, we’ve been Denver’s choice for hassle-free commercial concrete solutions. What makes McDonald Waterproofing & Restoration different is that we are locally owned and operated. Unlike many competitors in the industry, we don’t just skate by doing the bare minimum for clients. Our concrete contractors take pride in our reputation for innovative communication strategies and extremely high client satisfaction. It’s just part of why we’ve earned a reputation as one of the premier concrete restoration teams in the Mile High City. In the past, we’ve completed projects at Denver International Airport, Denver Corporate Center, Orchard Pointe, and Park Central, just to name a few. Just because we take on such large-scale projects doesn’t mean we lose sight of the little things. Regardless of your project’s size, you can feel comfortable knowing our team will approach it with the utmost honesty, quality, and care. We want to explain the aforementioned communication process a bit more. Early on as a team, we quickly realized that commercial concrete companies struggled to effectively communicate. We made it a point that wouldn’t be the case at McDonald. It’s why we create and deliver a Daily E-report for clients. Basically, this allows everyone to be on the same page. Owners and managers who are remote from the project can get a quick view of the project with ease. What clients appreciate most is they can see the exact number of personnel on their project, morning and afternoon ambient/surface temperatures, as well as what work has been completed and what’s on tap. No other contractor in the region makes use of such a system. If you have additional questions about our urethane traffic coating system, please don’t hesitate to reach out to our team. We look forward to hearing from you.